My earliest memories were being in a cage with my two brothers at PetsMart. We all had terrible colds and were receiving yucky medicine. The only thing yuckier was my name: Candy. Some nice people came by and played with me. Then they looked at some of the other kitties. Then they came back, played with my brothers, played with me, then took me home. 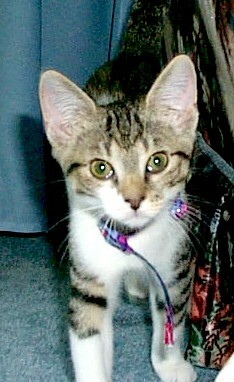 It was June 30, 2001 and I was 12 weeks old. One of my brothers almost went home with one of their friends, but he mumbled something about needing permission from "The Karen." I like to inspect everything, including cameras! My mommy took good care of me and I got better quickly. 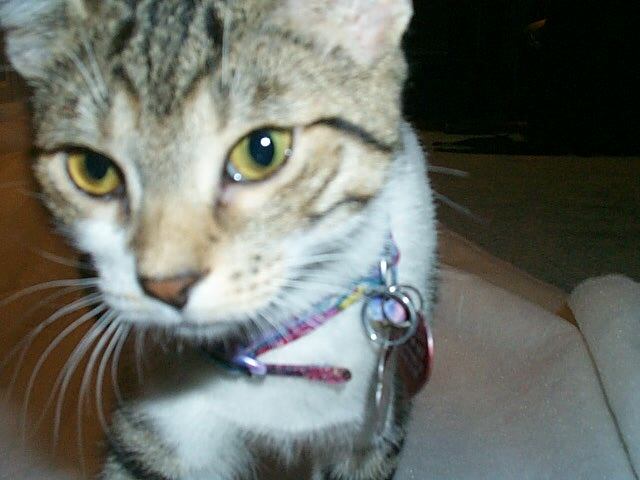 Unfortunately, my adopted siblings, Amanda (I used to call her "HissyCat") and Trepak started calling me "SnotNose". Then I was named "Isis Leonora," and I liked that name better. When the vet gave me the OK, I joined my siblings full-time. 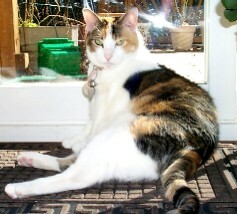 I found out that they lost a well respected and very sweet cat named Sandy Marie a couple of months earlier. Without her there, there was no leader, so, being a helpful soul, I decided to fill the leadership void and have been very successful in that role. As I've grown up, I've learned a lot, including that I can help others, which has made me into more of a benevolent ruler. Mommy taught me Reiki and I am a Reiki level II healer, which means that I can send healing to others as well as use my paws and nose to give healing. Trepak (the big cat) and me (at 8 months old) Trepak became my best friend and playmate. He didn't care about pecking order. He just wanted to play. 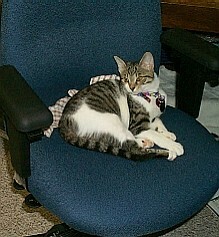 Unfortunately, he became very sick and crossed the rainbow bridge in May 2004. I really miss him! Sometimes I feel him around me. He was such a darling, big galoot! Amanda cared about order at first and I didn't think she was smart enough for the role. 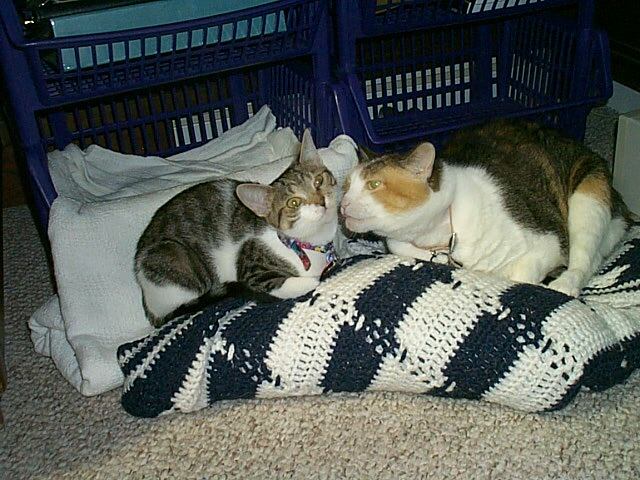 Trepak and I loved to tease her and HissyCat was sometimes called "Princess" because of her prima-donna ways. Over time, I discovered that Amanda didn't think pecking order was important, but that I should respect my elders. 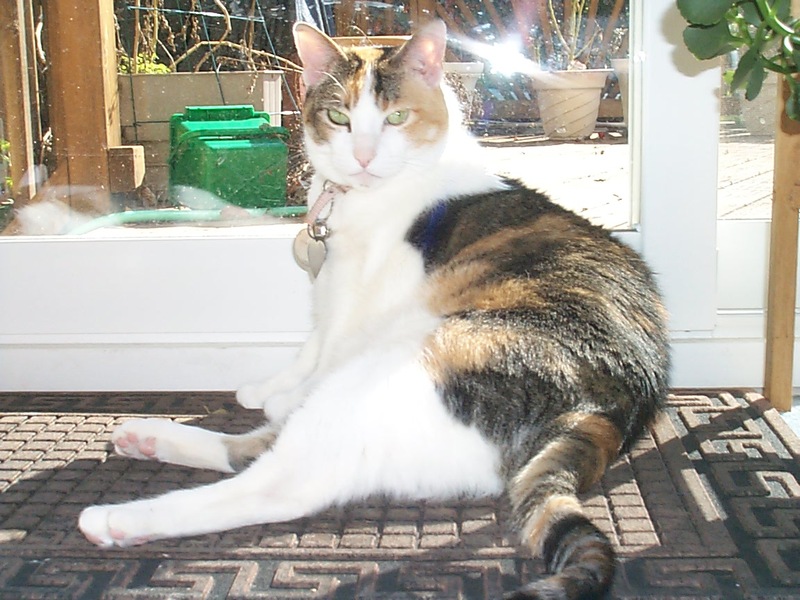 She became my friend and confidant and as she got older and arthritic, I wanted to help her. I often would give her healing and nuzzle up to her. 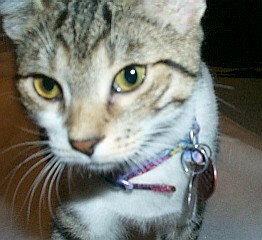 She passed away in May 2007 and I dearly miss my friend. I carry around this little stuffed kitty and put it in her favorite places as a way to remember her. 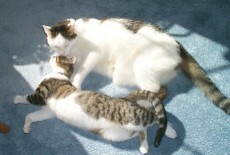 Several months after Trepak left us, Mommy asked if I wanted a new playmate and I said Yes! I wanted a playmate that I could rule and bend to my will! 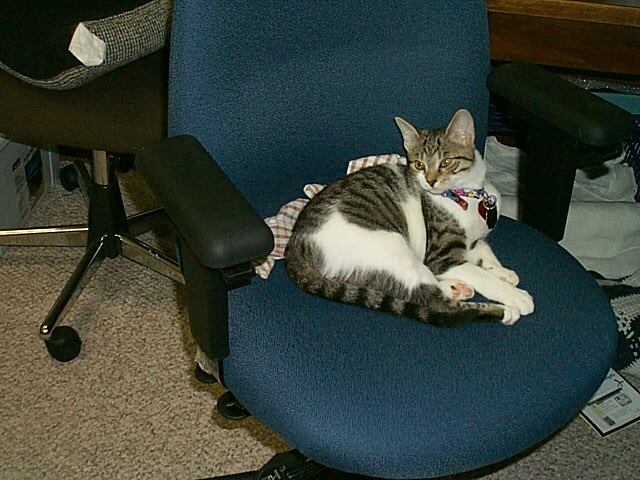 Then we got Jasper in September 2004. He wasn't what I was expecting and I was jealous of him because of all the attention he got. As it turned out, he was a sickly kitten, but I wish he didn't give me ringworm! Ick! Fortunately, Mommy had medicine for me to take that cleared it up. Jasper is my friend and he and I get along even though he isn't one to be ruled. He is twice my size, very sweet and caring, but can be stubborn! Amanda used to be my confidant. I do a good job of being in charge! I have a lot of names. Mommy calls me "My Isis" or "My Little Isis" a lot. For awhile, I was called "Queen Isis the Chicken-hearted" when I left some chicken heart on my breakfast plate. That lasted until I made it quite known that I didn't fancy being called Chicken! One day, my name evolved into "Isicle," and sometimes I'm called "Isisisiss"
I earned the name "Queen Isis, Supreme Goddess of the Universe", which is sometimes shortened to "Queen Isis". I refer to my Mommy as the "Queen Mother". I've been told that I make a good scarf, so I guess that's another name. I like to walk around on Mommy's shoulders. The other cats have stopped calling me "SnotNose." When Trepak got a really bad cold in September, 2001, I gave him a taste of his own medicine and called HIM "SnotNose". ; He wasn't amused. That's when they stopped using that nickname because it was getting confusing. I heard that Isis is the Egyptian Goddess of Routing, or something like that. Anyway, her co-workers make jokes about me batting packets under the routers. Others call me "Intermediate System to Intermediate System" or IS-IS. They say that it's a routing protocol. I have my very own nsap address. I've also redefined some basic isis commands for those who don't know the protocol too well. For more information about the actual routing protocol, check out the NANOG overview at http://www.nanog.org/mtg-0010/ppt/martey and read RFC 1142.
router isis This gets me on the router! no passive-interface I am the only implementation of isis that does not have a passive interface! net 49.0001.0101.6005.9180.00 This is my nsap address. The area ID starting with 49 is for local use within a network domain. The area ID is 49.0001. The system ID is the IP address embedded in groups of 4 digits instead of the normally viewed groups of 3. SystemID = 0101.6005.9180. (The 180 in the IP address comes from the fact that I joined the household on the 180th day of the year.) The last 2 digits is the Nsel, which is 00 for a router because I bat packets around like a router! Because this is a local address, I did not need to get into a really long CLNS address to ensure a globally unique nsap. For more information about NSAP format, check out some of the NANOG pages. This slide show is a good place to start. is-type level-1 I'm ALWAYS number one! spf-interval 45 This runs the Dijkstra shortest path first algorithm every 45 seconds. What that means is that every 45 seconds, I look for changes in the room and recalculate the shortest path to my favorite toy, to the nearest cat to play with, or to my food, depending on the time of day. isis circuit-type level-1 I'm number one locally and globally! isis hello-multiplier 3 level-1 This is the number of times I circle around someone's legs to say "hello"
isis hello-interval 30 level-1 This is the amount of time that I wait between my hello sessions. After I say hello, I wait 30 seconds, then try again. isis retransmit-interval 150 This is how long I wait between requests for attention or food. isis misbehave-interval 500 I had to extend the protocol to cover this contingency. This is a last-resort to get attention when the hello-interval and retransmit-interval activity fails to get me what I want. This is when I try to eat the plants or claw something I'm not supposed to touch. My mom helped me with this web page. I gave her the text and the pictures and she helped me to convert it to HTML. The background is a washed out picture of my fur. I'm Isis and although I'm the webmaster for the site, spammers have been ruining my fun. Contact me through Mom's contact form.